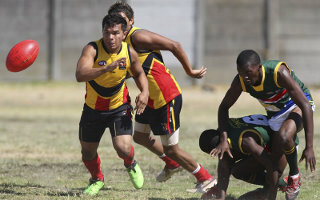 AFL South Africa has named the South Africa (Geminder Youth Academy) Squad To Play Against Australia Flying Boomerangs U/17 - on the 28th January and 1st February 2013. This is an U/18 Squad topped up with 5 players U/20 years. The team will be topped by players from North West and Gauteng for Potchefstroom game and for the Durban match will be topped by KwaZulu-Natal players. As previously reported, The Flying Boomerangs are once again headed for a tour of South Africa. The concept is a personal development and leadership program for Aboriginal and Torres Strait Islander young men aged 14 -15 years-old, supported by the Coles AFL Indigenous Program. 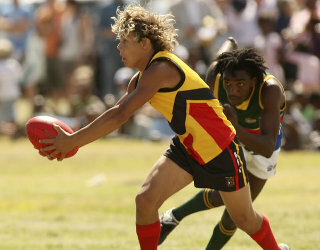 Selected from the 2012 AFL KickStart Under-15 Championships, the Flying Boomerangs squad of 25 players will play two matches against South African teams in Potchefstroom and Durban, coached by former St Kilda player Raphael Clarke. The Boomerangs will also conduct a footyWILD clinic in Cape Town township, visit Table Mountain and Robben Island where former South Africa President Nelson Mandela was imprisoned in 1964 for 18 years before being moved to another prison. AFL National Community Engagement Manager Jason Mifsud and AFL Indigenous Programs Coordinator Xavier Clarke are attending the tour. The Flying Boomerangs are holding true to their name and returning to South Africa for the fourth time later this month. Some of the most promising young Indigenous talent from Australia will be arriving for a two-week tour, coached by former AFL stars Chris Johnson, Andrew McLeod and Xavier Clarke. The Flying Boomerangs will play two matches against South African teams and will conduct footyWILD (Australian Football) clinics in Durban and Cape Town townships. “This is an outstanding opportunity for these young men to develop on and off the field. The tour will also share with South Africa the AFL’s experience of utilising sport as a vehicle to generate lifestyle outcomes for Indigenous people and communities,” said Xavier Clarke - former St Kilda and Brisbane Lions football clubs player. “It’s always a great opportunity for our town, Potchefstroom to host overseas visitors and most important for kids who are involved in our program throughout the year to come and witness the exciting game playing live. Our South Africa Lions players to get more experience and help prepare for the International Cup in 2014, which I hope to be part of once more,” said Sipho Magongo, footyWILD Development Coordinator. Back in 2009 we quoted AFL South Africa data showing 17,000 participants in Australian football in that country. But at the time the body had just undergone major expansion to cover four provinces and was switching instead to a consolidation mode to ensure the program was sustainable. Although completely understandable it was still probably not what international footy fans wanted to hear, always keen to see numbers growing rapidly. It seems that 2012 was a period of expansion again with numbers up to 20,000. 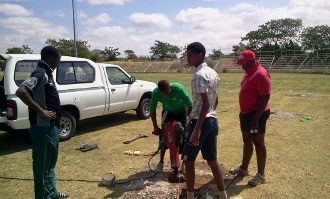 And AFL South Africa National Participation Manager July Machethe (pictured) has told worldfootynews.com that the aim by 2016 is 30,000 participants. Note that this includes the all-important umpires and school based mass participation programs. Machethe has provided a breakdown of the 2012 numbers into different categories, as shown below. Another area of interest is tracking senior footy and club development. In terms of developing an adult footprint and really entrenching the game then long term that will be key. We also saw back in 2009 how quickly players developed when exposed to regular football in Western Cape when a six team league was run and the province suddenly lept to national champion status. Machethe comments on progress so far to establish more opportunities like that. Further news is that Australian Anthony "Joel" Kelly, AFL South Africa's National Operations Manager for the last 5 years, has moved on with a replacement expected to be announced this month and quite likely to be a South Africa. AFL South Africa has had an interesting journey over the last 4 years. 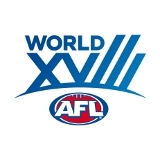 In 2008 it was widely considered the darling of the AFL, receiving more funding than other nations, regular AFL-organised tours and leaping to 3rd in the International Cup with a controversial win over Ireland. Player numbers were booming, partnerships were being signed with mining companies, plans were tentatively in motion to set up footy development for Africa via a university program based in South Africa and an AFL exhibition match was scheduled for Cape Town in early 2009. Then came the Global Financial Crisis, the postponement (after 4 years let's call it cancelling) of the exhibition match, and a decision to "consolidate" the recent growth. There was a slide to 5th at the 2011 International Cup and accompanying internal rumblings, the hoped for surge in AFL scholarships and rookies didn't eventuate, the South Pacific began to grab the international footy headlines and at the same time any good news from South Africa became exceedingly hard to extract. It was starting to look a bit grim for footy in Africa and this author was "sharpening" his keyboard to write an obituary, not for the game as such, but for the shiny vision of AFL SA leading the international charge. Happily there have been stirrings of better news and assurances that the future is bright. As first evidence of this we report on a recent string of grounds being converted to allow Australian football to be played on them. 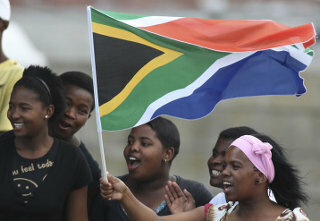 We hope to follow this up with further positive proof of the game's health in the Rainbow Nation. For most followers of footballers with an international pedigree the thoughts through most of 2012 in association with Frankston, a stand-alone club in the modern ‘VFL’ battling it out against both stand-alone AFL reserves sides (Geelong and Collingwood) and a host of AFL aligned VFL feeder clubs, the thoughts were mainly around Khan Haretuku. Out of nowhere came Chamberlin "Patrick" Ndongo with a mighty story that will lead who knows where. The Sydney Swans this week announced the following list changes, following the post season review period. Primary list players Jarred Moore and Mark Seaby have been delisted, along with rookie list players Eugene Kruger, Jack Lynch and Dylan McNeil. South African born Eugene Kruger was on the rookie list and did not play any senior games with the Swans in his time at the club. The AFL today announced the second group of players, Medium Midfielders to be invited to the NAB AFL Draft Combines to be held in October 2012 as part of its talent identification process in the lead up to the 2012 NAB AFL Draft. The NAB AFL Draft Combine, involving 120 players at National Level, will be held at Etihad Stadium from 2-5 October, with state Draft Combines to be held in Melbourne (6 October), Adelaide (13 October) and Perth (14 October). The AFL today announced the first group of players to be invited to the NAB AFL Draft Combines to be held in October 2012 as part of its talent identification process in the lead up to the 2012 NAB AFL Draft. In the video below Majak Daw and Ben McKinley join the AFL360 crew to preview the Foxtel Cup Grand Final (in which they will both be playing). The Werribee Tigers will take on last year's runners up, Claremont in Perth on Thursday night. Sudanes born Daw answers the question as to when he will be ready to play at AFL level and what he needs to do to get there, and discusses the pressures he feels. Former West Coast Eagles player and current North Melbourne listed McKinley discusses Claremont and what Werribee might need to do to beat them.